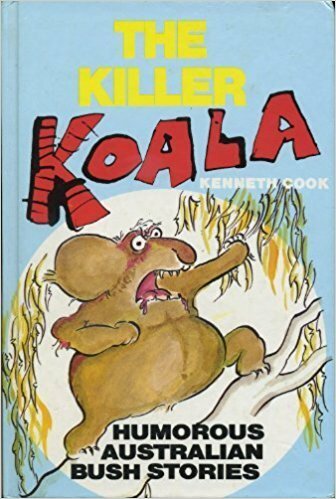 Home > 1980, 20th Century, Australian Literature, Beach and Public Transports Books, Cook Kenneth, Short Stories	> The Killer Koala: Humorous Australian Bush Stories by Kenneth Cook. The Killer Koala: Humorous Australian Bush Stories by Kenneth Cook. The Killer Koala – Humorous Australian Bush Stories by Kenneth Cook (1986) French title: Le koala tueur et autres histoires du bush. Translated from the English by Mireille Vignol. 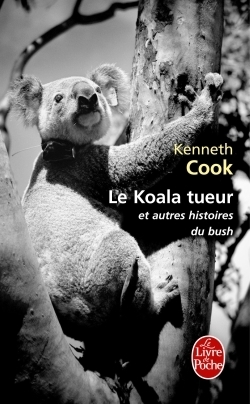 I bought The Killer Koala, humorous Australian Bush Stories by Kenneth Cook at the Fête du Livre de Bron and it seemed to be a common collection of short stories published in France. Since I’m reading Australian books this year, it sounded a light and funny read. I wasn’t mistaken, these fifteen short-stories are a wild ride through Australia. Not sure they are good for tourism, though. They might frighten potential visitors. To write this billet, I tried to find the list of the short stories’ original titles and I discovered that it’s OOP in the English-speaking world and I couldn’t find the table of content of this collection of short stories. So, sorry, I can’t give you the list. If anyone has it, please feel free to post them in a comment below. Kenneth Cook (1929-1987) is best known for his Noir novel Wake In Fright, a book I’ll read too. The Killer Koala is part of a trilogy of short stories, the other volumes being Wombat Revenge and Frill-Necked Frenzy. He loved the Australian bush and all the stories are related to his supposedly true adventures in the outback. They are too extraordinary to be invented, he said. South Australia, Coober Pedy and its crazy opal miners. Queensland, Airlie Beach, where he almost drowns when he goes diving in the Great Corral Reef. After reading these stories, only Victoria seems a safe place to be in Australia. Strangely, there’s no encounter with wandering kangaroos or monstrous spiders or poisonous jelly fishes. They must be too common, I don’t know. Or they’re part of the Wombat Revenge. Kenneth Cook is the Australian equivalent of Jim Harrison, I think. They both were bon vivant, liked food and alcohol and had the body to prove it. Working out wasn’t their thing. They loved the wilderness in their country, Australia for Cook, the Upper Peninsula for Harrison. Some of the stories also reminded me of Craig Johnson’s Wait For Signs. Twelve Longmire Stories, probably because of the hilarious story involving an owl, a bear, a tourist and a Porta Potty. The three writers share a love for life, a good dose of humanity and a deep respect for the natives. All along the stories, we see the narrator in dangerous situations, always told with a fantastic sense of humour. This large man who wasn’t in the best shape ends up in situation where he needs to run, walk, flee, swim, crawl or ride a camel to get out of perilous adventures. He’s not as good a gunman as he should be, which endangers him. He’s open and trusting and this leads him to interact with swindlers, nutcases, poachers and other various adventurers. In these stories, he has dubious encounters that almost lead him to disaster. It’s normal, otherwise there wouldn’t be anything funny and gripping to tell. However, I bet that he also met great people through his travels and thanks to his openness. When you read The Killer Koala, it’s not surprising that Kenneth Cook died of a heart attack in the Australian bush in 1987. If he really lived the way he describes in his short stories, he didn’t treat his body well and pushed it to its limits. I hope he died happy, doing what he loved. If anyone from Australia has read this, I’d love to hear your thoughts about it. If you want to know what these stories sound like, I found the text of The Killer Koala here. PS: Funny translation anecdote. I was reading several stories in a row and all involved animals. So, I thought that each story was about a different animal. When I reached the story Cent cannettes, I expected a story about a hundred quills (as ducks or cannette in French) and I read a story about someone drinking a hundred beer bottles (also a cannette in French)! The stories might be far-fetched but the dangerosity of the animals isn’t. I want to read Wake in Fright too. I’ve already read The Dead Heart by Douglas Kennedy, also crime fiction in the Australian bush. A sheer nightmare too. Emma, don’t worry! I have lived in Australia for over 50 years and the only animals that have ever bothered me were bees and mosquitoes… and I was once stung by a bull ant (which wouldn’t have happened if I’d been wearing shoes). If these stories are all true, I know he put himself in dagerous & remote places too. I have no intention to befriend a snake tamer. Books like this are probably the reason Melanie at GTL thinks it’s dangerous to live in Australia. I do see snakes sometimes but rarely up close, and redback spiders which are a bigger worry as they live in dark corners in or near the house (in dry climates only, I think). I’ve been on a camel ride with a friendly Aborigine (in Coolgardie, WA) but didn’t get abducted, nor the kids mores the pity. I don’t think I’ve ever seen a snake except in a zoo. I knew spiders were missing in these stories! Camel rides are common for tourists in Morrocco and Tunisia, countries often visited by the French. I haven’t read these stories though I think I may own them. I’ll have to have a look. The wild animal that worries me the most is the feral pig. They get pretty big and fierce, not so much in Western Australia but my uncle who farms in outback Queensland has been chased a few times. Maybe the story about the wild board was actually about a feral pig. Who knows what was the original under the translation of “cochon sauvage”. I thought it was “wild boar” but it could have been “feral pig” too. We tend to call them pigs rather than boars but I’m sure it’s the same animal. Wild can be a synonym for feral, but also for angry. Sauvage sounds like angry, but does it also have the meaning of say, belonging to nature? In this story, the pig was definitely feral, seeing how he ran after the narrator. You have to try Amy Witting sometime. I’m almost done with A Change in the Lighting which makes my third novel from her, and she’s amazing. I have I For Isobel on my wish list of Australian books. I’ll come to her.